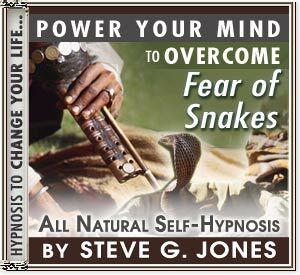 LEARN HOW TO COMBAT YOUR PHOBIA OF SNAKES WITH HYPNOSIS!! Hypnosis can help people to overcome many types of fears. The fear of snakes, technically known as “ophiciophobia,” can lead to a fear of the outdoors and keep you from getting the most out of life. Hypnosis is the answer by removing subconscious obstacles to rational thinking regarding snakes. Fearing snakes may not be such a bad thing, since there few other animal species that can induce a quick and painful death just with one bite. However, if a fear of snakes has you afraid to walk through the woods with your children or mow the lawn, then using hypnosis to overcome your fear is important. You will still have a healthy regard, caution and good judgment when dealing with snakes, but you won’t be restricted or controlled by fear. Most varieties of snakes are perfectly harmless. There are regions in the world, such as the South Western United States or the Amazon where there are dangerous snakes. The rest are just a bit mysterious and may catch you by surprise, but will definitely not harm you. Hypnosis can replace the irrational and crippling fear of snakes with a more realistic view and therefore enable you to participate in the activities you want without fear. Over the course of about 3 weeks, hypnosis helps you learn to relax. As you relax, the mind is opened to suggestions that replace fear with common sense. That is the method used by Clinical Hypnotherapist, Dr. Steve G. Jones M.Ed. in his self hypnosis program, “Fear of Snakes.” Following the program will clear out old misconceptions and underlying fears. You may never come to own a pet snake if that’s not your true nature, but you will be able to see snakes and not be paralyzed with fear.